Garlock BLUE-GARD 3300 Aramid Fibers and Neoprene Binder. A compressed non-asbestos gasket sheet of aramid fibers and high-temperature fillers with a neoprene (CR) binder. Handles service conditions with refrigerants and various petroleum-based oils. Excellent sealability. The Garlock® BLUE-GARD® compressed, non-asbestos (CNA) gasketing line offers a variety of elastomers to excel in a wide range of services. 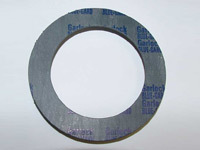 Garlock® BLUE-GARD® compressed gasketing offers excellent sealablitiy. The unique blend of aramid fibers, fillers and elastomeric binders provides improved torque retention and drastically lowered emissions levels. BLUE-GARD® CNA Gasketing offers cost savings by cutting operational costs through reduced waste, maintenance, stocked inventory, fluid loss, and energy consumption. Note: Other thicknesses and sheet sizes may be available by special order. DISCLAIMER: The information contained here is for reference only. It is believed to be reliable, but no representations, guarantees or warranties of any kind are made to it's accuracy or suitability for any particular purpose. It is recommended that users conduct their own evaluations for the intended application.